Here is one of the new Dreamweaver stencils. Cute! The design team will be posting a template on the fourth Sunday of the month this year instead of on Tuesdays. With the Superbowl coming Next week and lots of football (American Football, that is) parties being planned, we thought it would be fun to give you a "football" card template to play with. 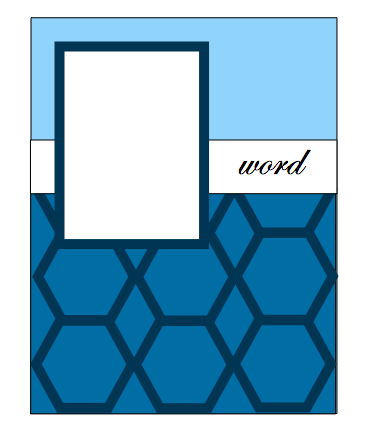 The finished card should be about 7x5 1/2" if printed at full size, but feel free to size to your needs. We'd love to see what you come up with. Email photos to FranticStamperSketchPhotos@yahoo.com and we'll add them to this post. Today we would like to share a great video from Hero Arts on their great collaboration with Sizzix; Hero Arts stamps that coordinate perfectly with Sizzix dies and embossing folders. We hope you will enjoy it! Hi! 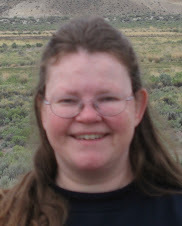 I'm Lis Whiting and I have been crafting for many years now, and have been part of the Frantic Stamper design team for two years, joining it for a third as an alternate. I currently live in California with two kitties who view my craft room as their personal toy factory, so they have to have monitored visits! I work full time at a hospital in the Finance Division which I also find very interesting. I am a lover of art in all its forms. I love most types of music, my favorite art "period" is hard to say. I love impressionist painters but I love art deco jewelry. I enjoy classical music as well as rock. I really like the Victorian period - steam punk really appeals to me. 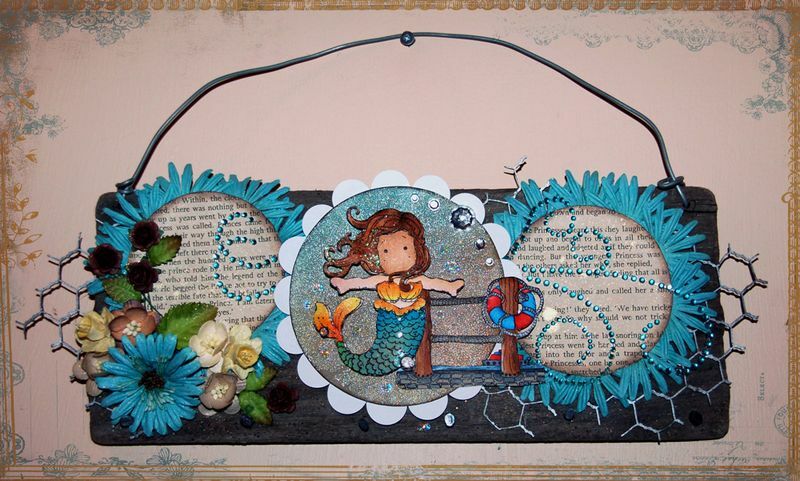 I am a real fan of Tim Holtz and his distress/grunge. My favorite color is cobalt blue. I like deep rich colors like emeralds, burgundies and browns. One of the questions that I was asked to answer is "how often do you window shop at Frantic Stamper?" I must admit that I look forward to coming home each day and spending a little "me" time (even if its only 5 minutes) by going to FS and seeing what's new! My favorite can't-do-without tool is, of course, my paper trimmer. I still have one of the old Fiskars grey trimmers that I use most often although I know I need to get a new one some day. If I had to choose any other tool it would be my die cutters. I have one from Sizzix and I also have an Accucut. I like to use thicker materials and these die cutters are absolutely essential! I have two sisters who think I am a little nuts but hey....at least they know where I am! The inspiration for my artwork...hmmm. That's hard to say. I think I am still finding myself. My biggest influences are the shapes of books, gears and the victorian period in general. I SO enjoy making cards and other paper creations. Putting paper together to make something beautiful is always a wonderful thing. Here are my submissions for the DT call. Today we have another simple card sketch for you. The bold pattern at the bottom of the sketch was intended to invoke the thought of a geometric patterned paper, or perhaps a geometric texture, but please feel free to interpret it YOUR way! These sketches really can be just starting points. Here are some of the Design Team members takes on the sketch. First up I have a card by Jane Larsson. 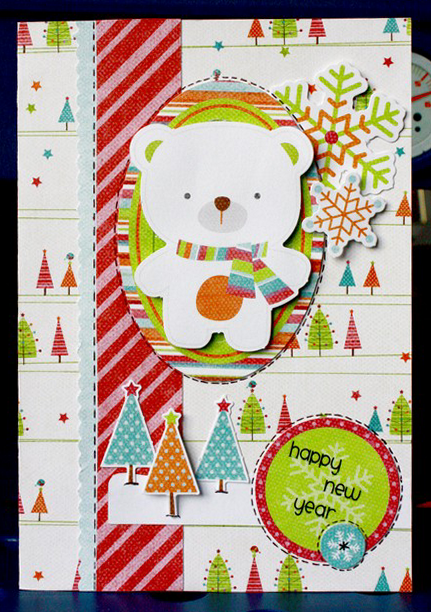 Here is a card by Jennifer Willis. 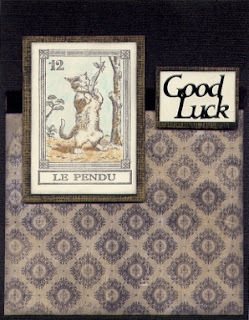 The stamp is from FranticStamper's line of stamps: Cat Tarot Card - Le Pendu. And how about a card by Sharon Jeffs? And here is Kathy Berger's take on the sketch (a Valentine's Day card). Reader Marcelle (Moz) Roberts decided to play along and sent us this photo of her card. Reader LaCretia Ogle also shared with us. Here is her card. We hope you, too, will give the sketch a try and share a card or two with us, too. Just email your photos to FranticStamperSketchPhotos@yahoo.com and we'll upload this to this blog entry. I have only one video for you today, but it is a long one, with a fun finger-painting technique. I tried the technique, and I have to admit I felt like I was 5 years old again! I just loved it! Check out Hero Arts Stamps and Distress Inks at FranticStamper.com. 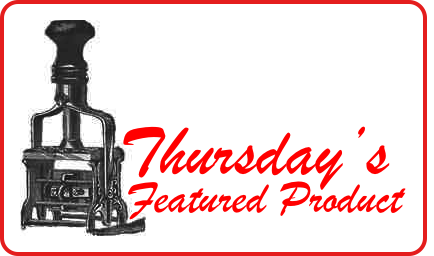 Warehouse Wednesday: New Web Site and Shopping Cart! 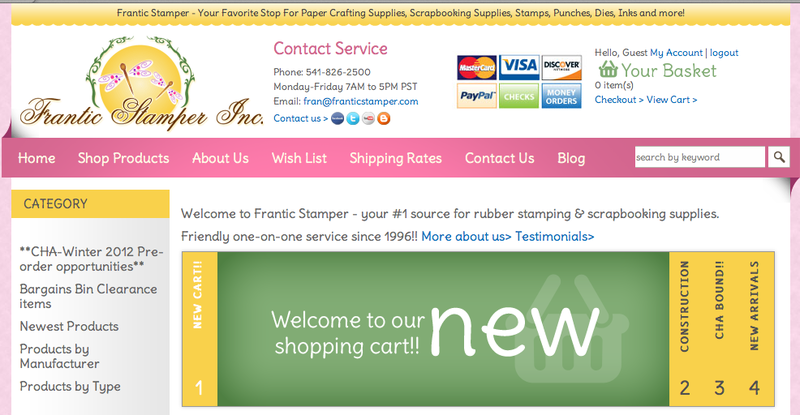 Frantic Stamper got a major facelift on Sunday! For the past several months we have been working diligently to bring you a brand new web site. In addition to a new look, the site features a powerful search engine that makes finding items easier than ever and a shopping cart to make shopping more convenient and secure for you, our customers. We have moved our most popular and newest items into the new site and are working to port the rest as rapidly as possible. There are already hundreds upon hundreds of man-hours (actually, mostly woman-hours) in this site, and we know we aren't done. So, we hope you will bear with us if something you need isn't on the site yet; the site is still a work in progress, and should be considered somewhat under construction. We hope that even with that caveat you will have an enjoyable experience using the site. Please note that though the shopping cart provides you with a convenient and secure way to shop, we will ALWAYS be here to respond to your questions and will continue to take pride in giving you the best possible customer service. You can always call us (during business hours) at 541-826-2500 or email us at fran@franticstamper.com. I bet many of you are like me: in the middle of a hectic life. Sometimes we just don´t have an evening to spend making a card you need for someone’s special occasion. That doesn´t mean you have to go buy a card! Today I made a card in five minutes, and that included the planning! I will tell you how I did it! 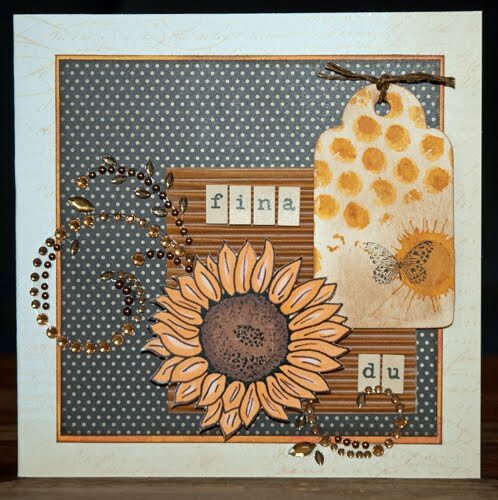 Items used: 3xBazzill cardstock, 1xpatterned paper, stamp, ink, embossing powder, fluid chalk, glue, button, stickers, paper cutter and a heat gun. The size can be chosen by the stamp you use. 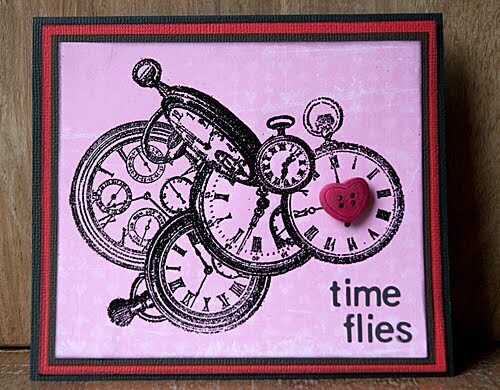 I used 9901-O Timepieces from Fran’s plate #99 which is the size 4.25" x 4.50" so here is how I worked with this clean & simple card. First I stamped on the patterned paper. I used Bo Bunny’s "Smoochable - Heart Strings" and put on the Embossing Powder and heated it up with my gun. Powder used: a shiny powder that has become one of my favorites: American Crafts Zing - Black with Opaque Finish. …TADA! All done! Quick, clean and simple! I live in sunny South Australia with my husband Matt and my daughters Emma (15) and Sarah (11). 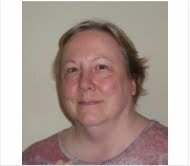 I am currently a primary age school teacher working with year 5 and 6 children. I began card making after finding a card making kit at a local market. By the time the kit was finished, I was hooked! 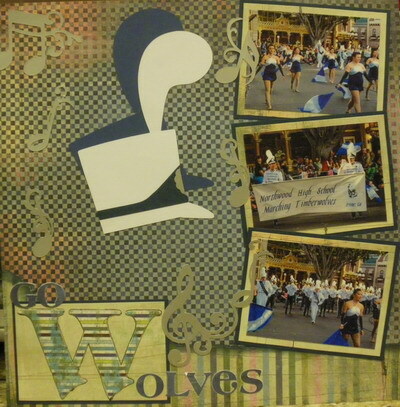 Since then I have discovered scrapbooking and love working creating all sorts of different projects. This begins my third year as a member of the Frantic Stamper Design Team, and I am energized and excited for the new year. I am looking forward to getting to know the new team members and to sharing all sorts of my work with you! Until my DT work is posted, you can see more of my work at my blog, http://www.justmeandthem.typepad.com, where I post my latest creations. Here were the pieces I submitted with my application for this year's team. I hope you will enjoy them! Today we would like to offer some tips for creating single layer cards that are quick, simple, yet elegant and sophisticated. Use a heavy-weight card-stock for your card. Without the extra layers to add stiffness, you will really need a quality heavy card. Make sure whatever you use to color your card doesn't bleed through your card-stock. Test it on a scrap before using it on your final project! 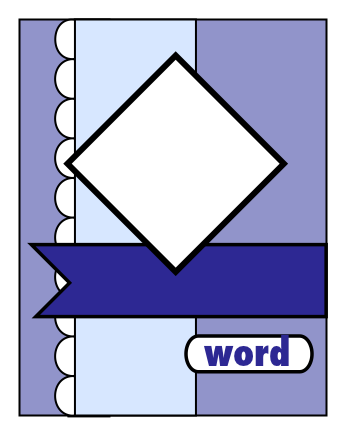 The layout for a simple card is really important to the success of a single layer card. Consider using a card sketch for your layout, or create a quick prototype of your card before making your final card. When using a bone folder to crease your card protect it with a sheet of typing bond so you won't leave behind a shine. 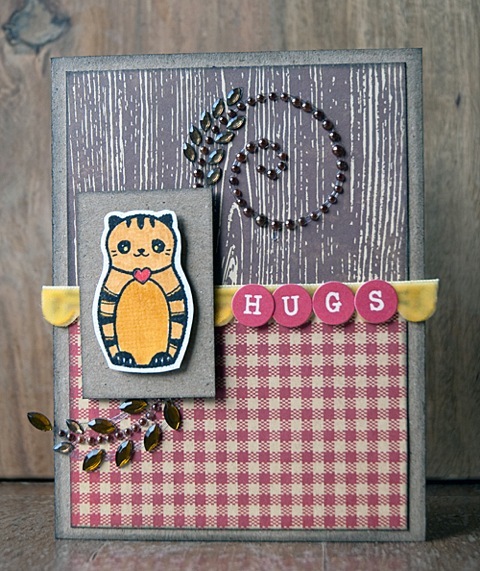 Create a faux-layer by dry embossing a border around the edges of the card. 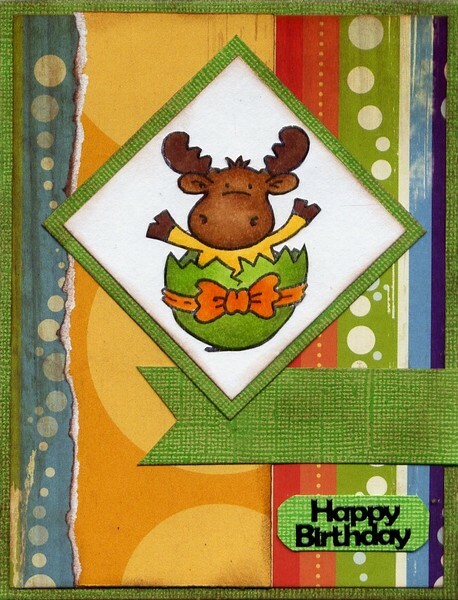 You can also create a faux-layer by masking the borders and creating a colored area in the center area of the card, or by masking the center and coloring the borders. 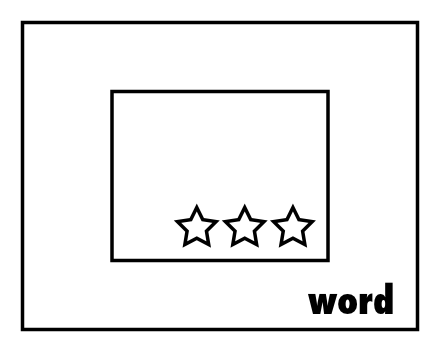 Punching a small shape out of the card front can add interest to the front, especially if it results in contrast with the inside of the card. 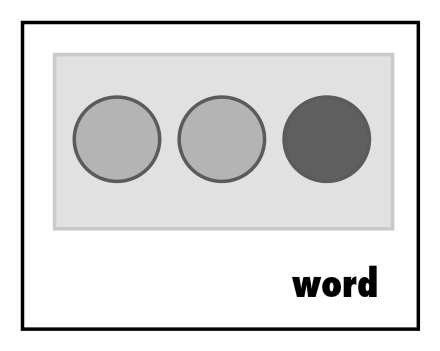 Choice of color can make all the difference in the world in a one-layer card. Bold, bright primary colors can make a card really vibrant and modern. 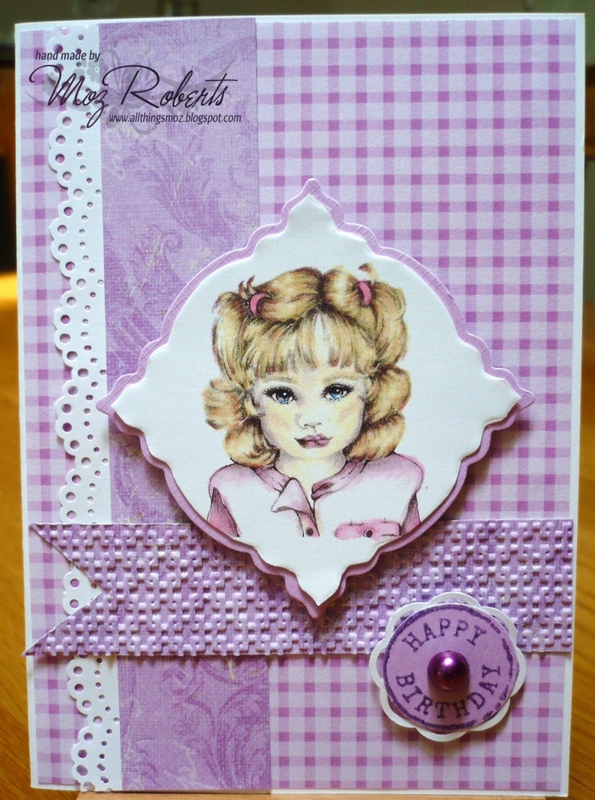 Pastel and monochromatic schemes can make cards look elegant and sophisticated. Since you have only one layer on which to make your statement, choose colors that enhance what you are trying to say! Try making some one-layered cards sometime soon. Here are a couple of quick sketches to help you get started. We wanted to take this opportunity to let you know that some changes will be coming to this feature (and others) as we phase out our 2011 design team and bring aboard the 2012 team. 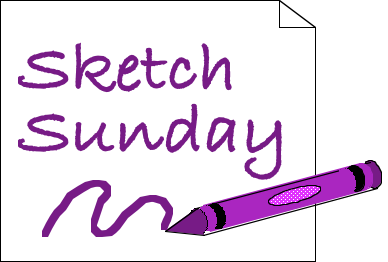 This year we will be posting nothing but card sketches on Sundays (Sorry, scrappers, but we will try to accommodate you in other ways this year!) and we will be posting our sketches less frequently; twice a month instead of weekly. We will be moving our Templates feature to Sundays, offering either a shaped card or other template one Sunday each month. Our Tip Tuesday feature will be being phased out as a regular feature, but a new coloring feature will be being added. We will continue to bring you weekly videos from our favorite manufacturers, regular news from our Warehouse, occasional product reviews and how-to's from our team, and, of course, fabulous design team projects in what we hope will be an ever greater number and variety. We are really excited about the changes, and about the new team. We are looking forward to sharing with you! So without further ado...here is this year's first sketch. 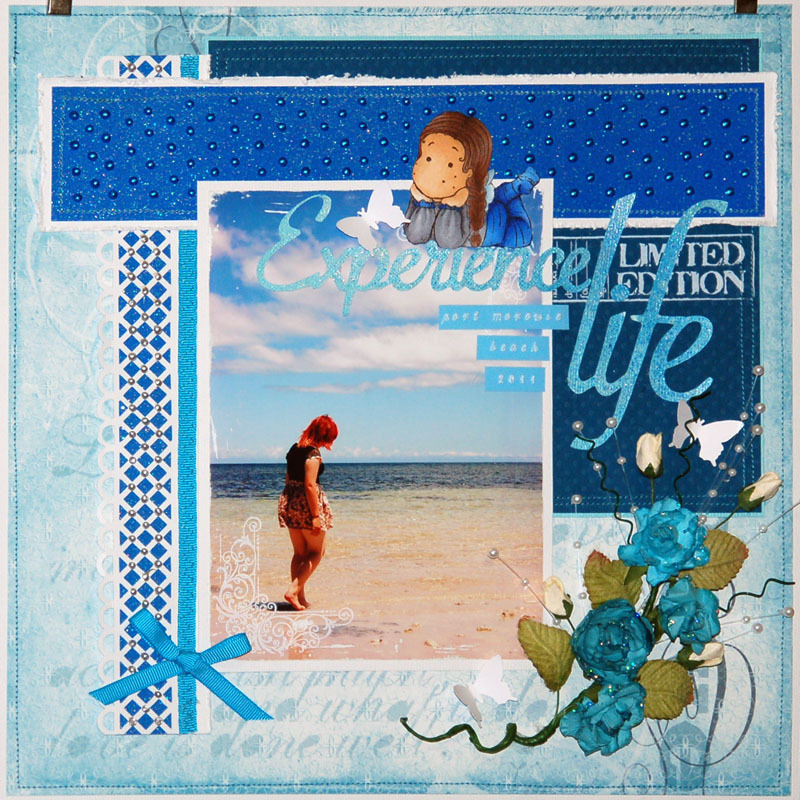 Here is a beautiful card made by our reader, Marxelle Roberts. If you, too, give this sketch a try and want to share your card with us, please just email a photo of it to FranticStamperSketchPhotos@yahoo.com and we'll add it to our post. This card is one of my favorite cards that I have made in a long time. I tried several new items with this card, and was pleased with how it all melded together. 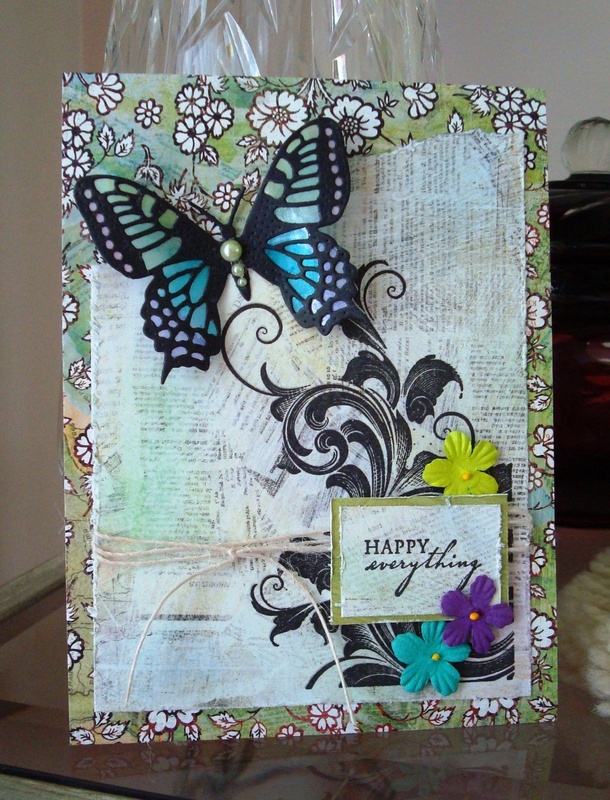 First off, I had purchased the set of small doily butterfly dies (and coordinating angel wing dies) by Cheery Lynn Designs, available at FranticStamper.com. The butterfly was easy to make and beautiful when finished. I first cut the “doily” butterfly from a black cardstock scrap. The angel wings (solid backing) were cut from a scrap of white vellum. I painted the vellum with iridescent Twinkling H20’s. I made sure I dabbed off any excess water from the vellum and dried it flat. When the vellum was dry, I glued it to the back of the doily butterfly. The H20’s on the vellum created a stained glass look. Very nice. I curled the wings over a paint brush handle to give the butterfly some dimension, and finished the butterfly with some pearls down its body. The card is made using two papers from Basic Grey’s “Out of Print” collection. The white text layer was torn and the edges distressed. 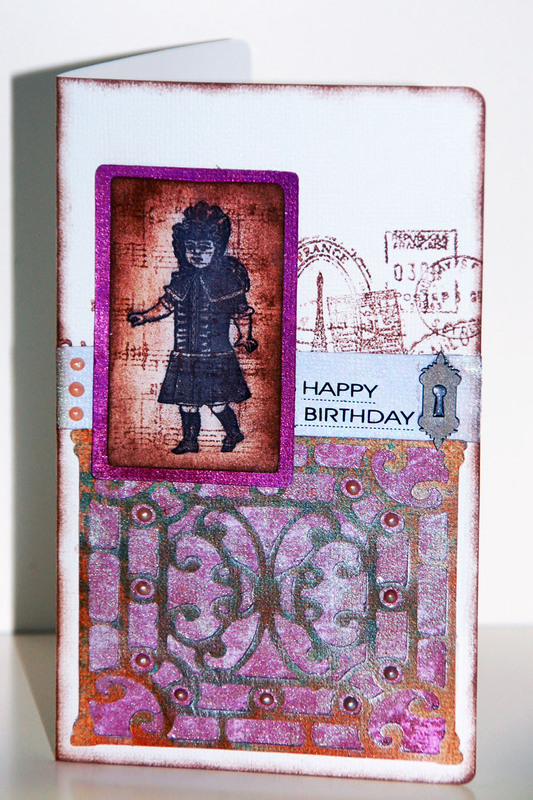 The cling rubber stamp I used is the beautiful Flourish #1 from Impression Obsession (this is a very versatile stamp!). 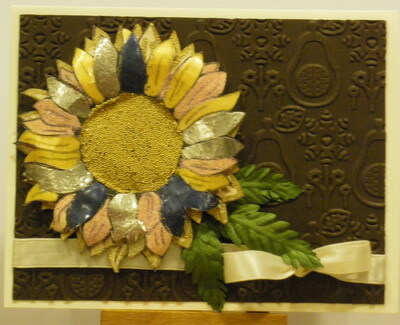 The card was finished off with a layered sentiment attached on 3D foam dots. 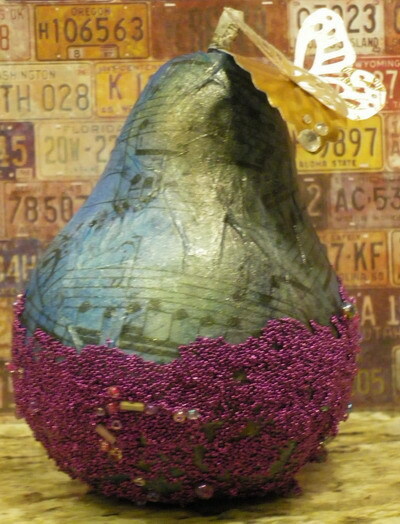 Embellishments include thin twine and small paper flowers. Simple yet elegant, don't you agree? Today we have a couple of videos for you that we think are just fantastic! First, Hero Arts offers this video to show how sewing on cards can make a real statement. Again, Hero Arts has some great tips! This time they are for making some fabulous bows for your projects. We hope you have enjoyed the videos today! I am a 41 year old mom who lives together with husband-to-be, our three wonderful boys and a cat in a small village in south of Sweden. 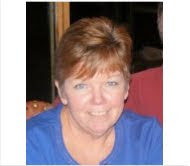 I work as a Financial Manager in our own business – and I absolutely love every part of my life! My favorite hobby is paper crafting. I also enjoy travelling and spending time with friends and family. 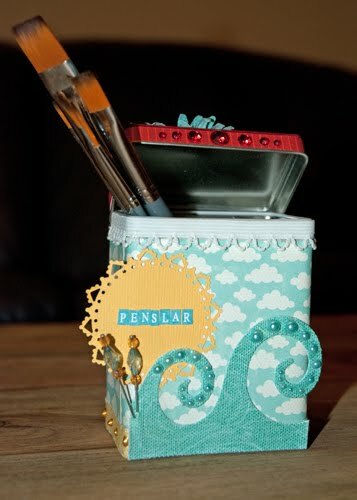 I have been paper crafting since 2004, and my favorite store is without any doubt Frantic Stamper. I hardly shop from anywhere else – that is one of the reasons why this mission means so much to me! Here are my submission pieces. The new slim-line punches have FABULOUS storage boxes available. but they also stack well, and stand up on a shelf well, even without the storage boxes! I am now buying my punches in this profile whenever I can! I know my collection is big and always growing, but my stamping space is pretty limited. Storage is thus a really important issue for me. 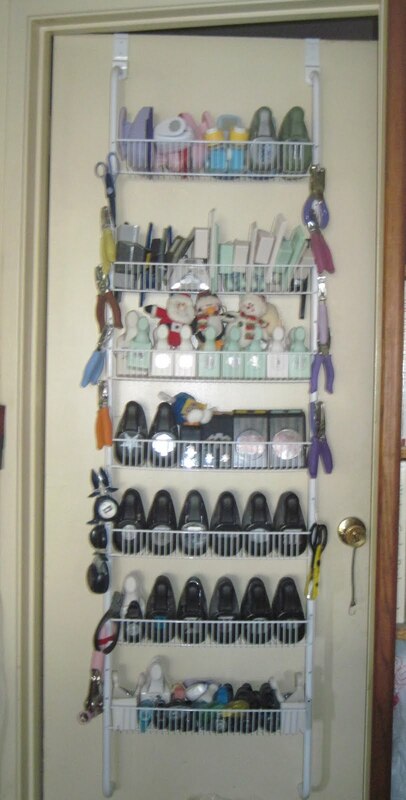 I use a rubbermaid over-the-door wire shelf system to store my mostly frequently used large punches. They are out of the way when I don't need them, but easy to access when I do! 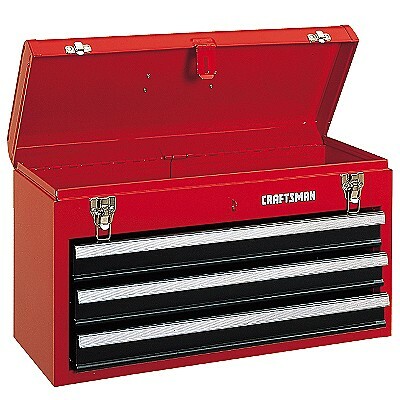 I use a large tool box (similar to the one in the following photo) to store my smaller punches, with each drawer used for a different category (floral, geometric, holiday). I use large Rubbermaid bins for my punches (yeah...I have a lot of punches). 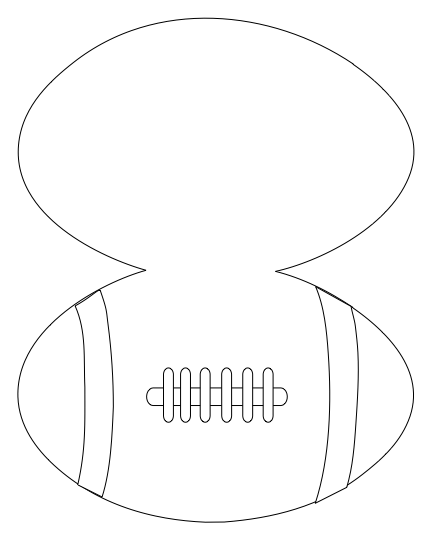 The punches are categorized by type such as borders or mega-fancy. I keep all my holiday punches in bags. One for Christmas, one for Halloween. That way I can pull them out easily. I use heavy-duty rubber bands on the handles of my punches to keep the punch in the closed position; they take up less room that way! I use towel racks for my most often used punches. I mounted them to a wall near my work space, and put my punches on them. This worked great for the old-style punches and for Martha Stewart punches, but I not for the new slim-line of EK punches. Those, and my others punches, are stored in an Iris cart, categorized both by size and subject.